The files on a Canon C300 are size limited to 2GB meaning a long take will be split into several spanned clips. Sometimes, you may have the problem that C300 MXF spanned clips are not combining and merging in Premiere Pro CC. This article is help you relink and convert C300 MXF to Premiere CC supported format. "I have an interview which lasts around 33 minutes giving me 7 clips. No matter which way I import the clips and which clip I choose to import I always get the full 33 minute clip. However for some unknown reason, Premiere has merged the spanned clips into the wrong order instead of playing back clip 1 then clip 2 and so on. It plays in reverse." As we know, Adobe Premiere CC does not recognize and handle the Canon C300 MXF files well. Especially when you ingest spanned clips, CC seems to get the order of the clips mixed up, so the start of the clip will be around the middle. 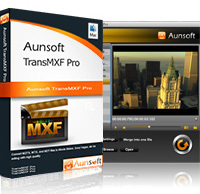 Aunsoft TransMXF Pro for Mac is an effective C300 MXF to Premiere CC Converter, which can easily relink and merge spanned clips into one file with correct order that you need for further editing. Have you encountered audio issues with MXF footage, such as audio losing, audio out of sync or audio tracks mixing? TransMXF Pro for Mac can automatically load audio counterparts as soon as you import MXF video, which effectively avoid of audio missing and cuts-off after C300 MXF to Premiere CC conversion. With perfect audio and video synchronization, the output format will preserve the high quality of source file. What's more, as the only completely multichannel MXF, no matter MXF footage with 1, 2, 4, 8 or more audio tracks, the program can output video without any audio tracks losing. Below is a simple tutorial to combine and transcode Canon C300 MXF spanned clips to Premiere CC MOV. If you don't need to preserve multiple audio tracks, TransMXF for Mac will be a good alternative, effective and affordable. 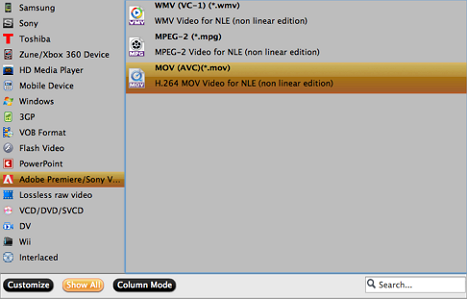 Click "add video" or "add folder" to load files to the C300 MXF to Premiere CC Converter. You can also directly drag files to the program. The program supports batch conversion and allows you capture images. Click "Merge" to relink MXF clips into one file. Click "Format" drop-down list to locate all the profile; choose the "Adobe Premiere/Sony Vegas -> MOV (AVC) (*.wmv) ". 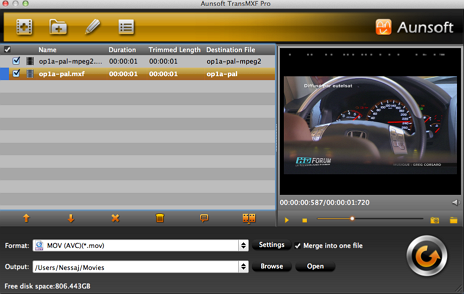 This option offers video profile optimized for NLE editing. You can also choose WMV and MPE-2. Click "Conversion" icon that the TransMXF Pro for Mac will combine and transcode C300 MXF to Premiere CC supported MOV. With just a click on "Open output folder", you can locate the export MOV quickly.